Water repelling and impregnating siloxane based agent with solvents. It presents high impregnating ability (micro technology) and great resistance to alkaline environments. Effectively protects artificial decorative cement or ceramic bricks, small and large size clay bricks, and cement slates. It maintains the breathability of the surfaces it is applied on and prevents water and atmospheric pollution penetrations. It does not favour the creation of mold and lichens on its surface. 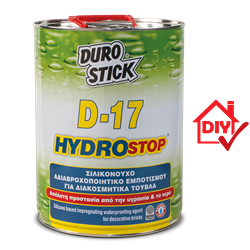 Its high quality ensures an enduring 10 year protection, when applying two coats with the ‘wet on wet’ application method. 200-400 ml/m², depending on the absorbency of the surface.